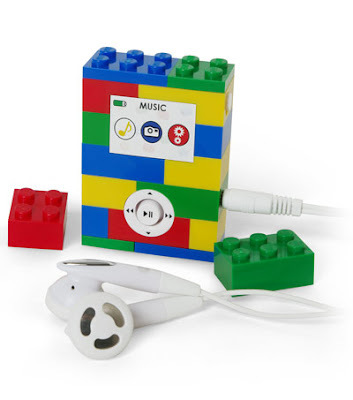 Sometimes you have to buck the trend to go smaller because who needs an iPod Nano when you can have a LEGO MP3 Player. Although the actual player doesn't lend itself to much customization, the top and bottom are fair game, apparently composed of regulation size studs (the nubs on top) and tubes (the holes on bottom that the studs snap into). Thus, it would seem like once you had the LEGO MP3 Player, you would have to build a LEGO belt case, in order to keep in on your hip while you were mowing the lawn. You could also build a version of an Ipod-type dock -- for when said player is not hanging precariously from your belt. It's time we went back to the days when technology added a bit of danger to our wardrobe, threatening to break lose at any time or force us to wear something on the other side for counterbalance. Because the only thing cooler than one MP3 player is a second one on your belt.